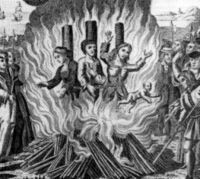 From the Crusades to the Inquisition to the martyrdom of Christian Reformers, to the Salem Witch Trials to the Klu Klux Klan’s battle against civil rights, Christianity has historically been behind many of the bloodiest wars. Even today as the fundamentalist/evangelical wings of contemporary Christianity struggle to stop abortions, marriage equality, undocumented immigration, and a myriad of other social issues, violence has been part of the strategy. As Schneider states: “It is also illustrated by the lengths to which leaders and cultures will go to assert their significance—for example through wars, decrees, religious symbols, and ethnic glorification” (p. 160). However, these polarizing effects are not just limited to Christianity. Currently Muslims and Jews are involved in conflicts that have deeply imbedded religious roots, with lengthy histories of violence against one another. As ISIS strives to create a radical Muslim state in Syria and Iraq, Hamas battles Israel for control of the Gaza strip. In addition, various religious factions continue to battle the existing regime in Syria, as well as one another. Especially pertinent to these battles involving Christians, Muslims, and Jews is their theology of being chosen by God as THE special people. This theology is what drives fundamentalist individuals in each of these groups to act with the impassioned belief that they are to do whatever is necessary to establish their religion as the controlling faith in their region, and ultimately of the world. The radical fundamentalists in each group believe strongly that they are justified in carrying out violent acts in order to establish their belief system as the controlling faith. What motivates each of these groups is the fear of losing their identity and their sense of power and control over their destinies. In their efforts to fulfill their perceived rights to dominance and power, they believe they can save humanity from the evil that overwhelms the world. Their beliefs and the outcomes of their actions are like a horse with blinders on, there are no other options or possibilities only that which they see straight ahead of them. If we are to ever experience peace in our world, we must learn to live with paradox, finding that place where we can accept the differences and contrasts in each other’s beliefs and history. Without this flexibility, we face a world of pain and destruction. Schneider contends that to bring about change and reform, we must root ourselves in an awe-based reformation. Awe is our fundamental relationship to mystery, and mystery is the essence of being. Although awe has been defined in myriad ways throughout history, I have understood it as our humility and wonder—or sense of adventure—toward living (Schneider, 2004, 2009) (Schneider, 2013, p. 107). What would our world look like if we were to adopt a humble wonder of one another? How would that change the way in which we relate or understand one another? More importantly, how do we free ourselves to experience this awe and wonder of one another? I believe that the answer lies in learning to love one another. This is not a general expression of loving all people, but rather a specific and intentional unconditional acceptance of one another no matter one’s beliefs, attitudes, and behaviors. Such unconditional acceptance—or love—requires significant work and openness to the sense of adventure to which Schneider refers. However, the basis of this unconditional love is an acceptance of our own unacceptableness. This unconditional love is rooted in the awareness that we have been accepted as something greater than ourselves, and that acceptance enables our self-acceptance. This acceptance or assertion of significance as Schneider refers to it, must be cosmic or greater than ourselves. To experience this awe-based reformation, we must first acknowledge a cosmic acceptance and significance that then enables our self-acceptance. The move from polarization to paradox, the move from a world of black and white to a world of paradox, the move from fearing unacceptance to unconditional love and acceptance is an individual journey. As more individuals undertake this journey, it will be an encouragement to others to join in this journey. The solutions to problems in the Middle East, as well as here at home, do not lie in violence, vengeance, or power—they lie in our individual ability to acknowledge and truly experience the cosmic nature of our person. We must simply accept that we are accepted! Tillich, P. (1949). The shaking of the foundations. Harmondsworth, Middlesex: Penguin Books, Ltd.